John Chrysostom, the archbishop of Constantinople (353–407), was famous for his eloquent preaching (the moniker Chrysostomos means “golden-mouthed”). His eighty-eight exegetical homilies on the Gospel of John read much like a social-science commentary. I will explain a few ways that honor and shame shaped his interpretation of Scripture. This post three areas where honor and shame influence Chrysostom’s exegesis. Chrysostom references honor-shame dynamics to expound the theology of the incarnation in John 1:1–14. Chrysostom says that John opens with the pre-existence of God’s Word because “he knows that men most honor the eldest of beings which was before all” (2:7). Chrysostom was adamant that the language of “son” does not imply inferiority to the Father. John used this expression son because he was “very confident that between Father and Son there was an equality of honor” (5:2). Chrysostom describes the incarnation (“the Word became flesh,” John 1:14) as a king conferring honor upon the lowly. “For the high when it associates with the low touches not at all its own honor, while it raises up the other from its excessive lowness; and even thus it was with the Lord. He in nothing diminished His own Nature by this condescension, but raised us, who had always sat in disgrace and darkness, to glory unspeakable. Thus it may be, a king, conversing with interest and kindness with a poor mean man, does not at all shame himself, yet makes the other observed by all and illustrious.” (11:1). Chrysostom uses the metaphor of wedding (cf. Mt 22 and 25) to explain John 1:13 (“Who were born, not of blood, not of the will of the flesh, but of God.”) The wedding invitation is “so great an honor,” but we behaved with insolence (10:3). God “honored us with all other honor; but we…have offered insult to him” (10:3). Because we acted unworthy and defiled our garments as invitees, “it is to honor the marriage and guests, that [God] drives off those bold and shameless persons” (10:3). Chrysostom read John as stories about people honoring or shaming Jesus. He says the opponents “use every artifice to destroy the honor of the Son of God… seeking eagerly to pull down Him whom they say they worship.” But their opposition to Christ will “fill their faces with shame and their souls with punishment” (3:2). In contrast, the apostle John was “not ashamed of the dishonor of his Teacher” (10:2). Chrysostom interprets Jesus’ miracle at the wedding in Cana (John 2) in light of honor and shame. He notes how the wedding hosts failed to properly respect Jesus—they “invite[d] Him not as some great one, but merely as an ordinary acquaintance” (21:1). Nevertheless, the famous Jesus attended the wedding not looking “to His own honor, but to our benefit” (21:1). And why did Jesus say, “My hour has not yet come,” but then perform the miracle? Chrysostom proposes, “He did it to honor His mother, that He might not seem entirely to contradict and shame her that bare Him in the presence of so many” (22:1). After the wedding, Jesus escorts his family home to Capernaum where he spent a few days “to honor his mother” (23:1). Contemporary exegetes might contest Chrysostom’s cultural insights, but he would likely agree with our attempts to read Scripture in light of honor and shame. Chrysostom’s homilies exhort listeners to appropriate God’s honor. The God who assigns honor is more honorable than mortals. For Chrysostom, the text of John (especially in Johannine passages where people reject Jesus) should refashion our “honor code.” These quotes illustrate Chrysostom’s reflection on the nature of honor. 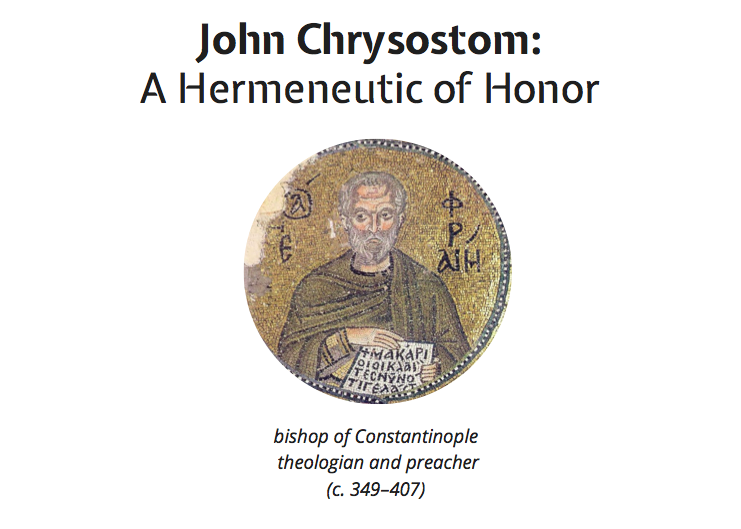 Overall, Chrysostom’s homilies on John provide a historical model for hermeneutics and homiletics from an honor-shame perspective. H. R. Stander, “Honour and Shame as Key Concepts in Chrysostom’s Exegesis of the Gospel of John,” HTS 59, no. 3 (2003): 899–913. All citations from John Chrysostom, “Homilies on the Gospel of John,” in From Nicene and Post-Nicene Fathers, ed. Philip Schaff, trans. Charles Marriott, revised and edited by Kevin Knight, vol. 14 (Buffalo, NY: Christian Literature Publishing Co., 1889), <http://www.newadvent.org/fathers/240111.htm>. Thank you for this article. It is an eye-opener, making me want to delve into the writing of Chrysostom and even more, into the Gospel of John. The comments on the incarnation also called to my mind the teaching of Paul in Philippians 2, and his testimony in chapter 3 of his realization of the emptiness of seeking one’s significance or honour in earthly, even religious, accomplishments. Our confidence can only come from understanding the relentless love of Christ, who, wonder of wonders, honours us (a la Chrysostom) as a king would in welcoming a poor, rebellious sinner into his own household. Appreciate your work in unveiling more and more about this critical issue of honour and shame.